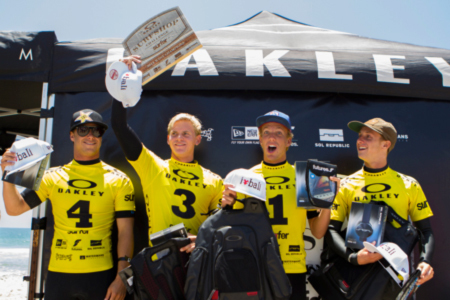 SAN CLEMENTE, Calif., April 28, 2014 – SURFER Magazine's 2014 Oakley Surf Shop Challenge is back on the West Coast at Lower Trestles this Friday, May 2nd for the West regional qualifying event. Originally scheduled for Newport Beach, surfers will be stoked for the opportunity to surf the world-class Lowers break without a crowd. The seven-event nationwide search is halfway through its yearly quest to find the best teams from stops in Florida, North Carolina, New Jersey, Hawaii and three areas of California. Four-man teams (two surf shop pros and two shop employees) will be competing for a chance to win an all-expense-paid trip to the National Championship in Central America, an advertising spread in SURFER Magazine, and the coveted title and bragging rights of best surf shop in the country. Last year, Team Revolution led by Nathaniel Curran stole the title from 2012 National Champions Jack's Surfboards. However, the West regional has historically been anyone's game with Jack's and Huntington Surf & Sport both making it to the Final last year and having Regional Championships under their belts as well.